At heart of Croze-Hermitage wine-growing area, L'Ermite 4 is a family house with wonderful views of the meandering river RhÃ´ne. High up on the Hermitage hill, you can see as far as the foothills of the Vercors. This quiet, spacious and welcoming gÃ®te is ideal for getting together with family. On the doorstep: hiking trials on the Hermitage hill past vineyards originally planted in the 13th century. 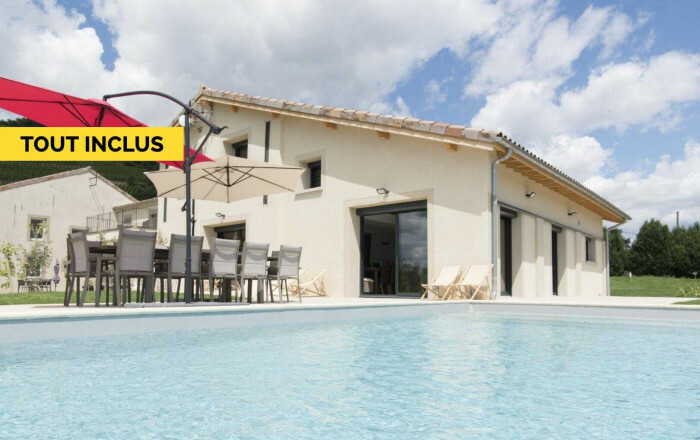 L'Ermite 4 is a comfortable, tastefully decorated family house. Ground floor: fitted kitchen, living room with panoramic view and lounge area (wood-burning stove), separate WC, 2 bedrooms (king-size bed OR 2 single beds) (king-size bed OR 2 single beds) each with en-suite shower room & WC plus access to terrace for master suite. Second Moroccan-style lounge with fitted kitchen & TV also on ground floor. 1st floor: bedroom (single bed) with co-working space (desks), 3 bedrooms (king-size bed OR 2 single beds) (king-size bed OR 2 single beds) (king-size bed OR 2 single beds) each with en-suite shower room & WC. Terrace with garden furniture and family-size table beside swimming pool. Wonderful view of the RhÃ´ne and vineyards.